About 10 million fires break out worldwide every day, claiming thousands of lives and destroying billions of dollars worth of property. Furthermore, the steadily growing world population, production capacities and energy consumption tend to aggravate the fire hazard. Therefore, fire protection is one of the most important objectives of each country. Automatic fire supression systems, which are activated by objective reasons and extinguish fire without human intervention, are among the most reliable means of firefighting. The most widely used Automatic sprinkler systems are most commonly used; they have sprinkler heads with thermal locks installed in water-filled distribution pipes forming an irrigation network (similar to checkrow net). When the thermal lock is actuated by the fire source, the sprinkler responds by spraying water over an area of about 12 m2. The design of this device is so simple and reliable that sprinklers are massively used at almost all inflammable sites; there are about 1 billion sprinklers in the world. For this reason, since the 19th century these devices have hardly been modified, remaining almost untouched by revolutionary changes in electronic and computer engineering. New firefighting solutions based on the use of fire robots (FR), which embodied the latest achievements of science and technology, have greatly extended technical possibilities of automatic fire suppression systems. The fire robot generates a jet of water supplied to the long distances in the fire area through a hydraulic monitor. The design of the fire robot allows changing the jet direction spanning the range of 360° horizontally and 180° vertically, entirely covering the surrounding space within a radius of its action. The jet spray angle may vary from 0 to 90°, thus creating multiple jets. The area protected by the smallest fire robot with a flow rate of 20 L/s and a jet supply range of 50 m is more than 7,500 m2 (πR2 =π•502). The entire flow of the extinguishing agent may be directed onto the fire area and provide the intensity of coverage of more than 1.2 L/(s•m2) in an area of 12 m2. Due to such high intensity, the fire can be quickly suppressed at the early stage of fire development. The sprinkler systems should consist of about 650 sprinklers and 3 km of pipes to protect the area of 7,500 m2. Although the maximum flow rate for the sprinkler systems is defined on the basis of operation of 10 sprinklers in the area of 120 m2, they can only create a fixed intensity of coverage. For example, in areas with fire load of up to 1,400 MJ/m2 at the sprinkler system's flow rate of 30 L/s, the standardized intensity rate of 0.12 L/(s•m2) is adopted. The higher intensity can not be provided by the sprinkler system due to its design. Having even fewer resources of pump flow, the fire robot is able to create a water and foam fire-suppressing attack at the main line, which exceeds the intensity of sprinkler systems by ten times. Moreover, the fire robot can cover large fire areas (including 120 m2) by horizontal jet scanning with the minimum intensity of 0.12 L/(s•m2). Fig. 1a and 1b show diagrams of the sprinkler and robotic suppression systems. The comparison of process parameters of 2 systems, which are fundamentally different, indicates significant opportunities inherent in the new systems: protection of large production areas; creating a controlled flow of the extinguishing agent of high intensity over long distances; quick extinguishing of fire sources at early stages of fire; 3D fire suppression within the entire protected area, including vertical surfaces; automatically discontinued fire suppression upon fire extinction. Fire extinguishing is carried out from one point throughout the protected zone, which saves a lot of kilometers of distribution pipes and hundreds of sprinklers. In the coming 21st century, the rapid development of electronics and information technologies, a significant reduction in their price in relation to the hardware, and the rational use of resources determine significant technical and economic advantages of the robotic systems. Such achievements as "machine vision" and industrial controllers provided the fire robots with important high-performance tools: three-dimensional fire positioning system in both visible and infrared ranges, as well as the jet guidance system onto the fire area, taking into account the jet ballistics. 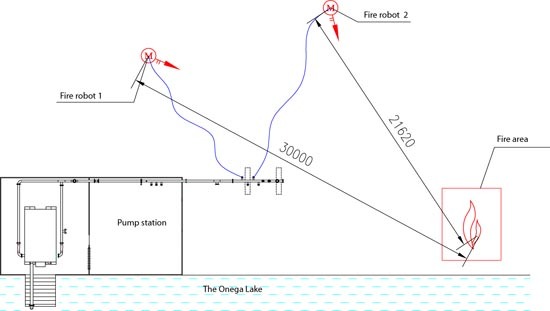 One of the main tasks of the fire robot is targeting the jet at the fire area by the given coordinates. The fire detection devices of the fire robot define the coordinates in the 3-dimensional coordinate system. Fig. 2 shows the coordinates of the focal point of the fire area (meeting point A): the distance Rn from the nozzle to point A, and angular coordinates in the vertical and horizontal planes β and γ . The optical axis of the fire detection device is aligned with the fire robot’s nozzle positioning axis, so in the horizontal plane, angleγcoincides with an angle of the nozzle positioning. In the vertical plane, positioning angle α does not coincide with angular coordinate β of the fire area, as the jet moves along a ballistic trajectory. 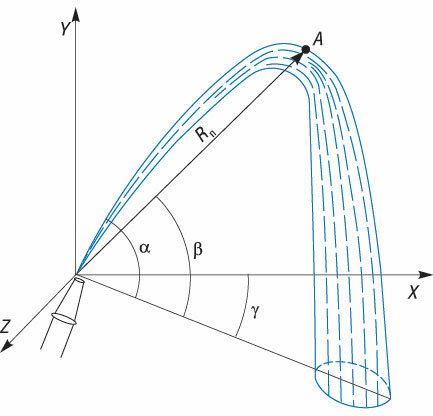 The value of angle α depends on several factors: radius Rn, angle β, pressure Í, flow rate Q, the jet angle f, nozzle design. The task of targeting the jet at the fire area by the given coordinates involves locating the nozzle positioning angle α, at which the jet trajectory has to pass through the meeting point A. It is necessary to know the parameters of the calculated trajectory, so it would match the actual jet trajectory with sufficient accuracy. Remember that the jet ballistics considerably differs from the solid ballistics due to physical factors that are unique to the jets: a decrease in the density and an increase in the jet cross-section while the distance from the nozzle increases, the formation of a two-phase gas-liquid flow in spray, etc. Due to a large number of unidentified factors, there is still no mathematical equation for the jet trajectory. The research and calculations required for solving the problem of automatic jet targeting within the given coordinates are based on the pilot parameters of the jet trajectories obtained empirically during long-time work carried out by "FR" company. 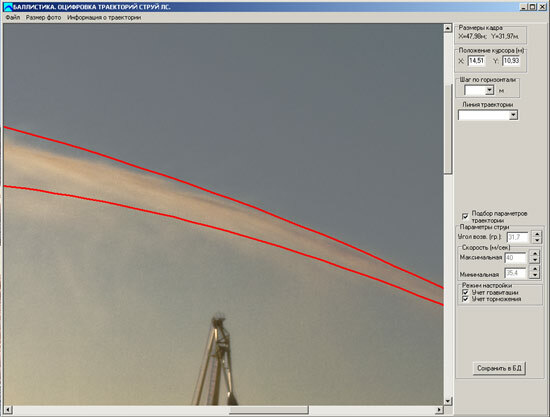 Photography was used for obtaining images of jet trajectories. Before the photographs were taken, the operations had been carried out to identify the linear distortion of applied optics. A special software application was developed, making it possible to select the upper and lower boundaries of the jet trajectory (see. Fig. 3, 4), as well as to register the coordinates of trajectories. A series of engineering photos of fire monitors with different flow rates was made, depending on the angle and pressure, a database of actual trajectories was created, which then formed the basis for calculating of the trajectories. The series of curves displayed in Fig. 4 shows the actual jet trajectories depending on the positioning angle α, which characterize a direct effect of gravity and air resistance on the jet spray. The curve grid is formed together with the ordered arrangement of trajectories, for example, with positioning angles α through 10°, representing the graphic image of gravitational and air field effect on the jet, depending on parameters of the jet such as the pressure and flow rate. Such grids of jet trajectories, which are composed for different parameters, including nozzle structural features, are digitized and included in the database stored in the computer memory for a particular type of the nozzle. With this grid of trajectories, the intermediate trajectory passing through the given coordinates is defined by using the approximation method and the interpolation calculation formula that is used in approximation theory. 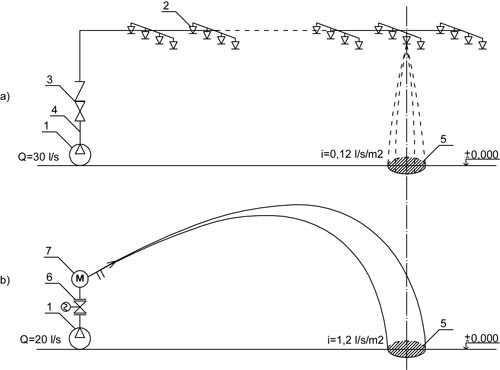 The initial trajectory parameters explicitly define the desired angle α of the fire robot nozzle pointing, where the jet trajectory gets to a specified coordinate. 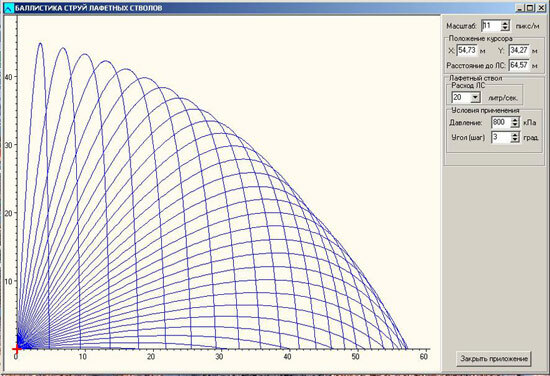 On the basis of these trajectories, a software application was developed according to the established technique to determine the jet trajectory depending on the positioning angle at a predetermined pressure and flow rate (see. Fig. 5. 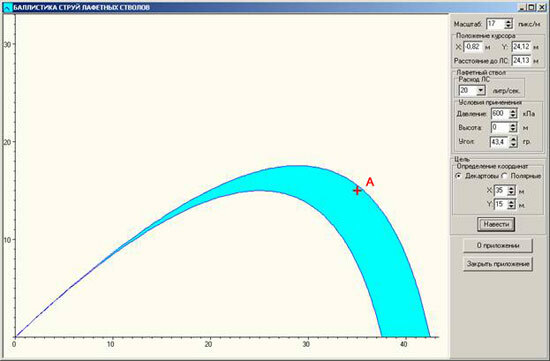 Application for the jet trajectory calculation). The application solves the particular problem as well: a desired nozzle positioning angle is determined at a given meeting point (the coordinates of a detected fire area). Among the known types of the fire robots, including android and mobile ones, stationary fire robots are most commonly used. This is explained by the need to maintain continuous water supply for the fire robots in considerable quantities. Indeed, even for the fire robot with a small flow rate of 20 L/s, 72 tonnes of water are required during one operational hour. Therefore, stationary location of the fire robot at the main fire pipeline is justified. Fig. 6 shows one of the latest versions of fire robots. There is an intelligent fire detector at the fire robot’s head operating in the visible and infrared range, and, in fact, it is a cybernetic center with an information processing system for the fire identification and determination of fire coordinates and the size of the fire area. 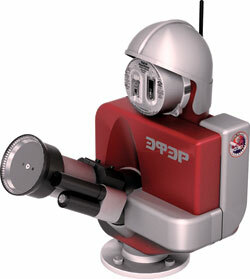 The working body of the stationary fire robot is a fire monitor (an automatic monitor) that automatically maintains the pressure at flow rates in the range of 8 – 80 L/s to provide the optimum parameters of the jets in this range, and generates a spectrum of jets from a solid to a maximum spray jet (90°). The jet guidance and control of the jet discharge angle are carried out through its modern electric drives with servo systems. The controllers to the drive control units help to determine the jet movement on complex trajectories. The arrangement of electrical equipment is made in a single compact housing. The fire robot's housing is dust and water protected version with IP65 explosion protection degree and a built-in system regulating climate temperature and humidity. The housing protects the electrical equipment and the connecting cables from the effects of high temperature, short-term exposure to an open flame and various types of mechanical effects. The robot's working zone covers the entire surrounding space within the jet radius, up to 85 m.
Fig. 7 is a functional block diagram of a robotic suppression system (RFSS) with a fiber optic control network with the Ethernet data transfer. The RFFS includes the stationary fire robots and control devices. The RFSS management is arranged through firefighting control device (FFCD). In the automatic mode, when the fire alarm (FA) annunciators are actuated by the signal from the fire alarm control panel (FACP), the FFCD activates the RFSS via the Ethernet. In addition, the FFCD generates control signals for the technological equipment (to actuate the pump station and smoke exhaust system, to shut off the ventilation system). The fire ground commander may control the RFFS by using the FFCD, a remote control unit (RCU) or a radio remote control unit in the remote mode. The operator’s automated workstation (AWS) serves for the system debugging and site configuration data input. Fig. 8 is a plan diagram of the RFSS firefighting. The coordinate determination of the fire area is made from two observation points by two fire robots. It provides data on the coordinates in space in three-dimensional coordinate system, including the fire area dimensions in height and width, the distance to the area, to define the angle of elevation and the extinguishing program according to the dimensions of the fire area. A television camera (TVC) is provided to perform remote control. The TVC equipped with machine vision and special software application allows the operator to identify the jet and its position (Invention Patent No. 2433847 ). This enables prompt and accurate jet direction towards fire front, efficient firefighting directly over the fire area by means of jet scanning. At close distances, the jet angle of up to 30 degrees is taken, providing gentle diffused water supply, which is critical, for instance, in petroleum firefighting, where a strong stream would lead to bubbling and increase of fire intensity. The fire tests of the RFSS (Fig. 9) were carried out on the model fire area of class A with a fire load of 2,402 MJ corresponding B1 fire hazard category. 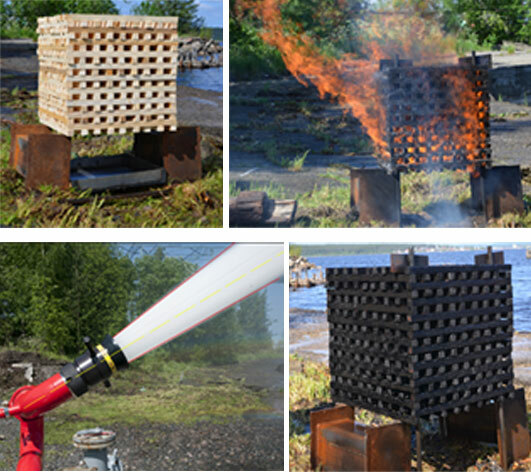 The model fire area with total mass of 115 kg is made of a bar block with dimensions of 40×40 mm and a length of 800 mm. The number of bars in a pile is 180 pcs. The surface area is 18.66 m2. The diagram of the fire tests is shown in Fig. 10. The RFSS has 2 fire robots. Before extinguishing according to the procedure, the fire area was blazed during a set time. When testing, the fire robots located the fire area in less than 20 seconds. The positioning error when scanning did not exceed 5° in accordance with GOST 53 326. The extinguishing time was 1.5 minutes at a standard time of 60 minutes for a premises group 2 according to Table 5.1 SP 5.13130.2009. The RFSS’s have the ability to control fire areas, so the duration of the water supply can be defined by the actual time required for firefighting. In the absence of combustion, extinguishing discontinues automatically. At the initial stage of the fire, creating a high intensity in a small area can quickly suppress the fire and save water as well. This is much more efficient than the water flushing according to the normative time. The broad technical capabilities of the fire robots are particularly pronounced in the protection of sports and entertainment facilities with the massive presence of people. Zenith Stadium (see Fig. 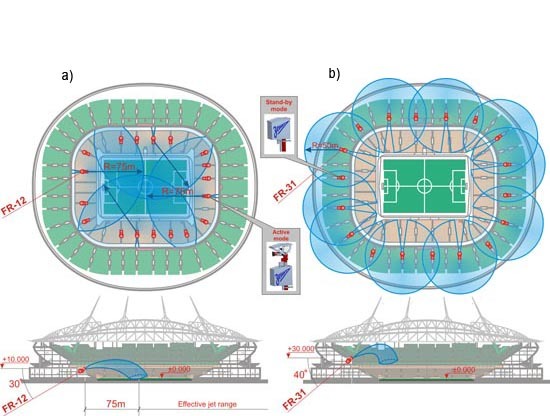 11) is a multifunctional football stadium of the highest A category (International Classification – Elite), with year-round use equipped with a retractable field, retractable roof and a flagpole, with a total capacity of at least 68 thousand seats. 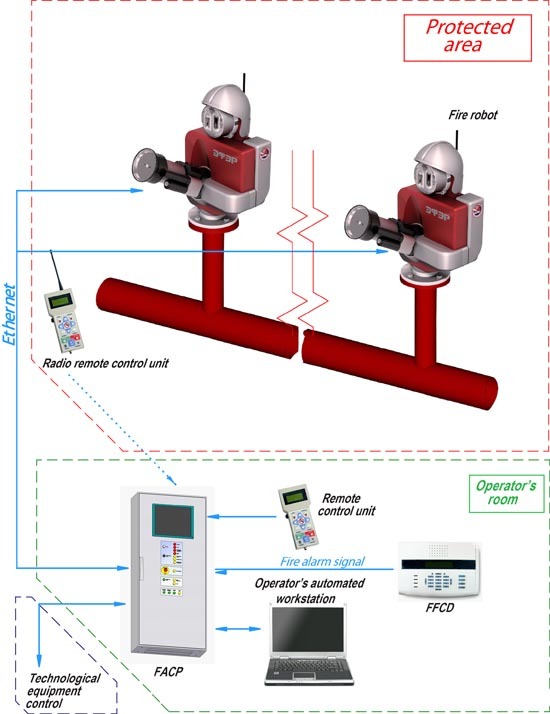 Automatic system of fire robots is designed to extinguish a fire in the zone of the seat blocks with simultaneous signaling on the system operation and status in the fire security post room. The system consists of the fire robots and pump station. Automatic fire suppression in the area of the seat blocks is provided by the fire robots' direct and sprayed jets. The water blasting is carried out simultaneously by 2 fire robots with a flow rate of 40 l/s each with the pressure of 0.6 MPa. The fire robots are installed in two tiers: lower tier of a) at 6,000, and upper tier b) at 25,200. The fire robots are vandal-resistant. The loop pipelines are provided for the water supply on each tier. 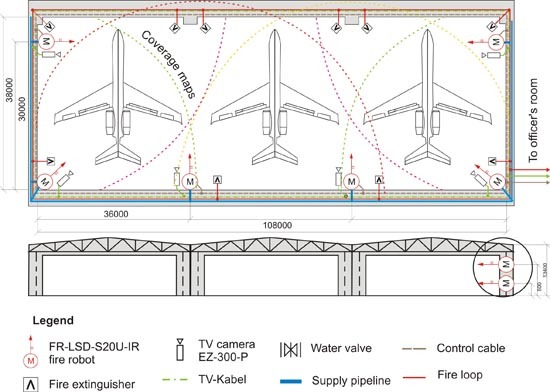 The application of the fire robots is especially important for protection of hangar complexes of B2 fire hazard category used for parking and aircraft maintenance; the complexes must have automatic fire suppression system, see Fig. 12. Fire is intended to be extinguished with simultaneous supply of foam solution by 2 fire robots equipped with ejector devices. Cooling of engineering structures and aircraft near the fire is advisable to carry out with water supply from 2 fire robots in manual and remote modes. The operational time of the steel framework cooling system is taken to the firefighting installation operational time and smoke deposition time. The fire robots and fire alarm annunciators are placed in 2 tiers in order to enable the prompt fire area determining and extinguishing over the hangar entire area, including under the aircraft fuselage. 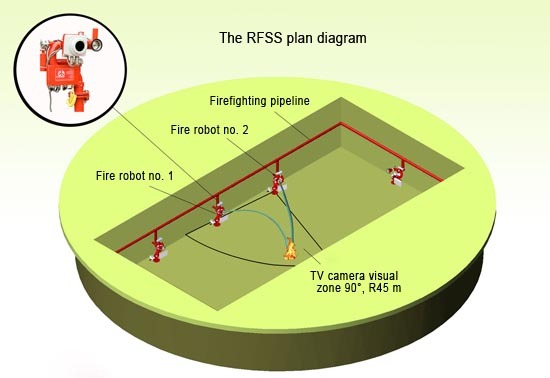 The fire robots placement height is determined in view of their characteristics, the hangar height and aircraft dimensions with coverage of each protected surface point by two robots. In this age of computer technology, priority should be for intelligent systems that respond to the real course of events, possess the features of self-regulation and reprogramming flexibility. Due to significant evolutionary changes in technology, cost reduction of electronic devices available to the consumer, the fire robots are becoming a new mass product of fire automatics industry, which solve the problem of fire protection in all spheres of human activity. Fire brigade, reinforced with the fire robots, these iron firefighters, represents a fire brigade team of the 21st century, which combines the achievements of the fire protection and fire automatics. This team significantly increases the efficiency of technical means used for firefighting. The presence of the fire robots makes the work done by man in extreme conditions easier and safer.